Today is November 4th, and what is without question, the most historic day in my entire life. ‘Why?’ you ask. Well because today I was able to cast my vote for the first time in American history, for a Black man (or at least a half-Black man). While I waited patiently outside my polling station for 2 hours with hundreds of other excited voters, all eager to place their individual stamps on history, you could literally feel our collective excitement. Vate with MTV rocking his colors at Bay Street Station, Montclair. I saw many of my neighbors, with their spouses and kids, all lined up, chatting it up with other neighbors and friends. There were lots of cameras, and it seemed that everyone was intent on capturing the moment on film and video. There were several people, including myself, who whipped out their phones to snap a few pics. 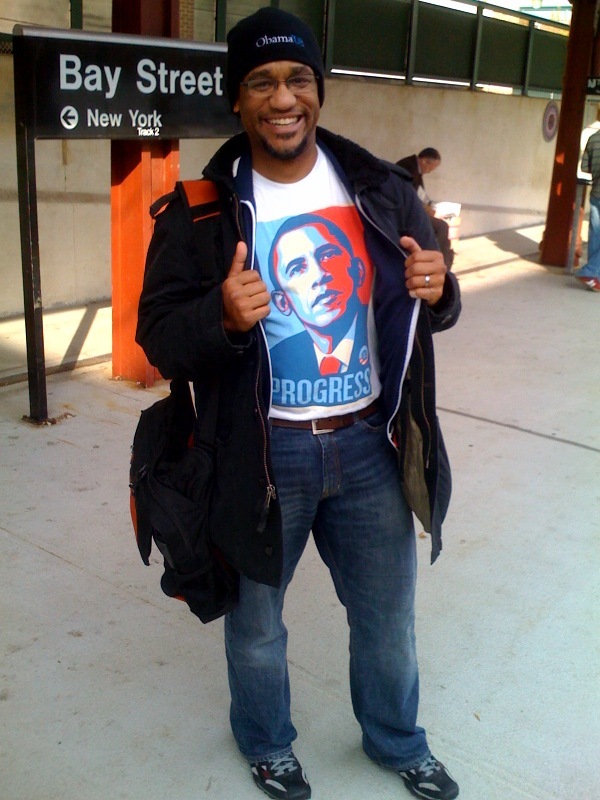 On my way in to the office, I snapped the picture above of Vate, one of MTV’s IP attorneys in full Obama regalia. It seemed everyone I encountered was filled with enthusiam about the possibilities for tomorrow. I’m cautiously optimistic about tomorrow, but that’s as far as I’ll let myself go (for now). 8 years ago, I just KNEW that Al Gore was going to be our next President, and that he would shepherd in a new day for America. He was America’s choice (at least according to the popular vote), but the day after the election, George W. was our president. Huh. How’d that happen? As such, I know that (while it may be a longshot), McCain and the powers that be, could still bamboozle Americans once again. Vate (old boy from MTV) said that in order to pull that off, they’d have to steal votes in nearly every state. I told him that they’d only need to steal them in certain states, because its not the popular vote, its the electoral college vote that counts, so you flip the script in a few key strategic states (Ohio, PA, FL, you get the picture), and that map goes from blue to red. Just so everyone is clear, I believe in the power of positive thought, so tomorrow Obama will be our 44th President. Don’t get it twisted. But today is still here, and we’ve got to push on through to the other side. I was talking to a reporter from the Star Ledger (as I forced her to interview me and get my opinion) and she asked me why I thought this was such a historic event. I told her, quite simply, that the use of social networks, the internet and mobile in this election was unprecedented, and it signaled a new day in American politics. Now I doubt she’ll quote me so eloquently (if I even make the cut into tomorrow’s edition at all), but it’s true. We are in a new era when it comes to the methodology to employ to reach one’s constituency. Obama’s political machine knew this inherently, and the proof is in the pudding, come tomorrow. For now, I’m basking in the magnamity of the day, trying to take it all in. I’ve got my paper, Obama t-shirt, voter registration card, and other pieces of the day for posterity. Whatever happens, it will be momentus. If you haven’t already, take part in this historic day and go vote.